Faced with a rise in refugee claimants fleeing harrowing conditions of war in their countries of origin, and racism in the United States, politicians from all three levels of government are blaming the decades-old shelter crisis on people in desperate need of refuge. Erasing over 20 years of their own complicity in creating and entrenching homelessness, politicians are playing political dodgeball over who should pay to shelter refugees. The fact that their political rhetoric is increasing bigotry and the potential for racist violence towards an already traumatized people seems to matter little. Toronto is in the midst of a housing crisis that is a product of over two decades of municipal, provincial and federal refusal to build new public housing and co-ops, and to adequately maintain existing housing. All three levels of government permitted the unrestrained expansion of the private housing market – run by landlords, developers and property speculators – that uses homes as cash cows to be milked for profit. A whole generation of people has been priced out of homes, and almost half the renters in this city struggle to pay rent. Average rents in the city far exceed the entire income of those on social assistance. Homelessness became a serious problem in the 1990s, and has worsened dramatically. The city’s emergency shelter system never kept pace with the rising demands and has faced a bed-shortage since the late 1990s. In 1998 City Council made a commitment to fix the bed shortage, but in the 20 years that have since passed, they refused to dedicate the resources to make that happen. Meanwhile, the homeless death toll keeps rising, with at least 100 succumbing to the harshness of life on the streets in 2017. The informal tally maintained by volunteers at the Homeless Memorial since 1985 now exceeds a thousand dead. For over two decades homeless people and housing advocates have fought tooth and nail for the expansion of shelters and public housing. These fights have forced a few life-saving victories: the creation of 24 hour women and trans drop-ins, respite centres, and the addition of a few new shelter beds. But with successive Mayors, Premiers and Prime Ministers relentlessly pushing service cuts and refusing to clamp down on the private housing market profiteers, the fights have largely prevented existing services from being lost entirely. They have not resulted in the sufficient expansion of shelters or the creation of housing that is affordable for poor and working class people. Those in power rule by dividing and conquering. Poor and homeless people who were born in Canada, and those who have lived here a long time, should remember that our well-being has never mattered to such politicians. Mayor John Tory pushed through a 2.6% cut to shelters in the 2017 budget and actively sabotaged attempts to add 1000 beds to the system. When he campaigned to become Mayor in 2003, one of his campaign promises was to ban poor people from panhandling in the downtown core. Provincially, first the Conservative government gutted social assistance, and then the Liberals ended the need-based cost-sharing agreements for shelters and homelessness services with municipalities. Federally, funding for building new social housing and coops was eliminated in the mid-nineties, in many ways initiating the crisis we see today. The “National Housing Strategy,” announced last year, doesn’t commit any major funding until after the next election, and will not lead to an expansion of rent-geared-to-income housing. The only way for poor and homeless people in Toronto to win is by refusing to fall for the divisive traps politicians are setting for us. 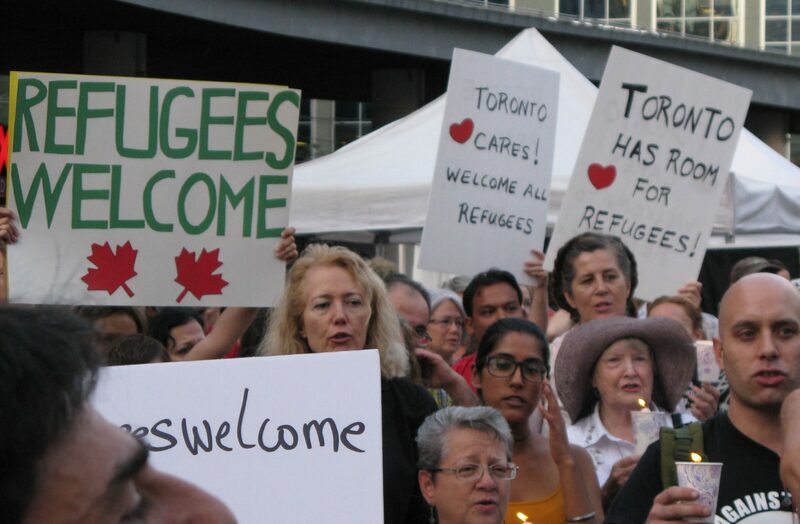 Most people in Canada today are immigrants, or are descendants of immigrants, and we must unite with the refugees who have been pushed out of their nations by politicians who share a lot in common with those who run ours. Let’s welcome refugees and build a united front powerful enough to win decent shelter and housing for us all. Fight To Win.